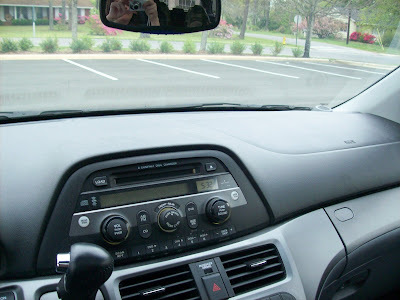 When I was forced to make the leap from our paid-for Ford Explorer to a new Honda Odyssey before Jake was born, I sort of went kicking and screaming. 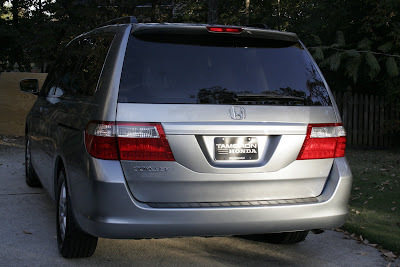 I'd sworn I'd never drive a minivan, but three car seats wouldn't fit across the rear seat of the Explorer no matter how hard I tried to make it work, so I went down to the Honda dealership and bought the Odyssey. Side note: I didn't even test drive it before I bought it. I figured, there are so many of them on the road, what can be wrong with it? I was very pregnant at the time and still struggling with bad nausea and vomiting. I had to get up from the salesman's table seven or eight times while I was there to go throw up. ANYWAY, I'm sure most people would have felt like they needed to test-drive it first, but all I wanted to do was get it over with. I did the same thing when I chose a college, actually. I chose Samford University on the basis of its brochure and never set foot on campus until Freshman Orientation Day a few weeks before school started. Weird, I know. So, back to my story. The Odyssey really HAS been a nice vehicle, and I have no complaints other than the fact that it's a lot lower than the Explorer was, and I enjoyed sitting up higher. Also, the cargo space in the Way Back (that is a proper name) is deep rather than wide, which is sort of a pain in terms of packing and unpacking the space. OH, AND THERE'S THIS ONE OTHER LITTLE THING. 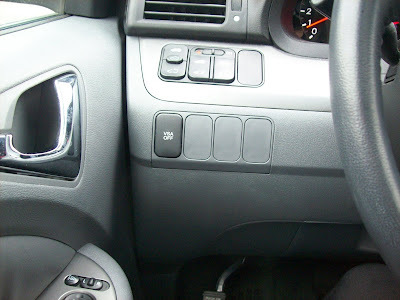 See where the release is for the gas door? No? IT'S WAY DOWN THERE BY THE EMERGENCY BRAKE RELEASE. Now, I know this is a small thing. 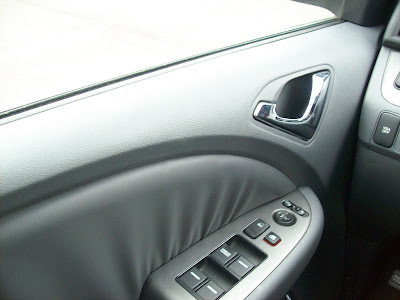 But it's almost physically impossible to reach it while sitting in the car, so you have to open the door and lean down or get out completely. I know you're thinking, "Well, you have to get out to pump the gas anyway, so what's the big deal?" And I have no answer for you. 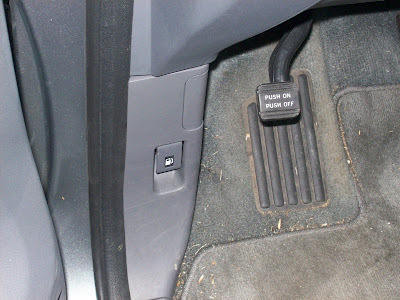 I do not know why this bothers me so much, except that it seems like they added the release as a complete afterthought, when everything else the vehicle needed to function properly had already been dropped into place, and someone asked, "Hey ... what about the gas door release?" And the boss was like, "Well, let's just put it down here. That will work great for the people with 4-foot-long arms." I know the ACTUAL dashboard isn't best from the "straightest line to the gas tank" point of view, but what about here, which is only about 19 inches from the spot the release currently calls home? REALLY, HONDA? You couldn't come up with a single, solitary, better place for this button? Perhaps in the '10 model they'll correct this egregious ergonomic error. By the way, 5 years later, I still LOVE my Odyssey (and I was NEVER going to be a minivan mama!!!). I'll always have a fondness for Hondas because of the Smurf Blue Civic and the Prelude, both of which were our first cars. They were so reliable and lasted so long, and I'll always associate them with Mom and Dad. How about the hood release? Even worse that the gas door release. I HAVE 4 foot arms and cannot reach it. I have to open the door and get out. But I would not trade the minivan, and the kids, and everyone else's kids, love it. Yea, that was Lisa. I am creating a google account right now. Lisa, I have the same issue with the hood release, but I don't have to pop the hood once a week ... thankfully. 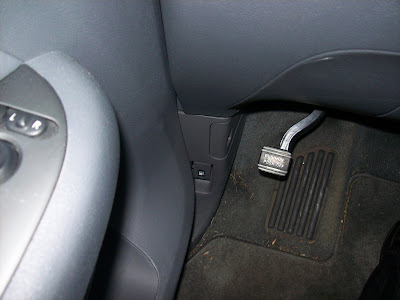 If it makes you feel any better, I've got a Town & Country with an emergency brake release I actually have to get out of the car to use. I come close to rupturing my spleen every time I try to reach it from the driver's seat. And I'm 5'8". YOU'RE 5'8"? I know that isn't the pertinent part of your comment, but WOW. You must have had a growth spurt after I moved away. Ha!